Pool, house, and mountain view at night. Front entry of house from wrap around driveway at night. Mid-century architecture at its finest. Back patio and outdoor dining area at night. 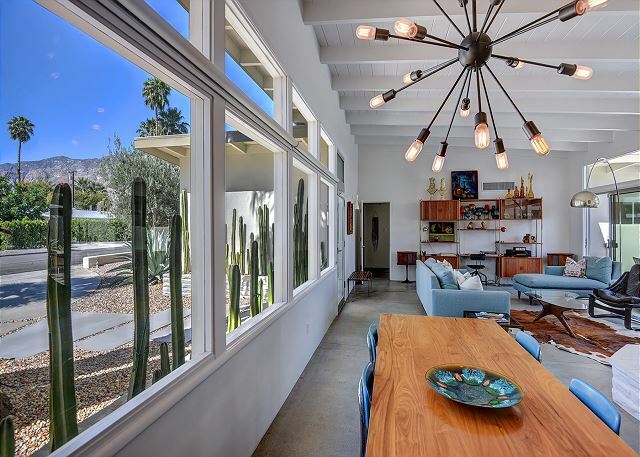 Multiple seating areas, chaises, and floor to ceiling mid-century windows. Pool patio seating areas. 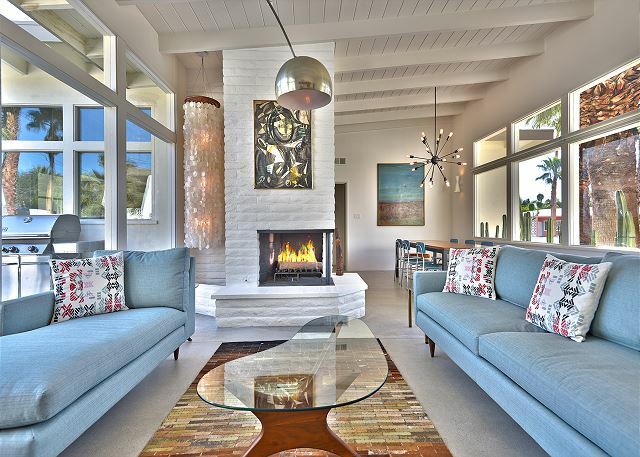 Living room with fireplace, arc lamp, floor to ceiling mid-century windows and a sliding door out to the pool yard. 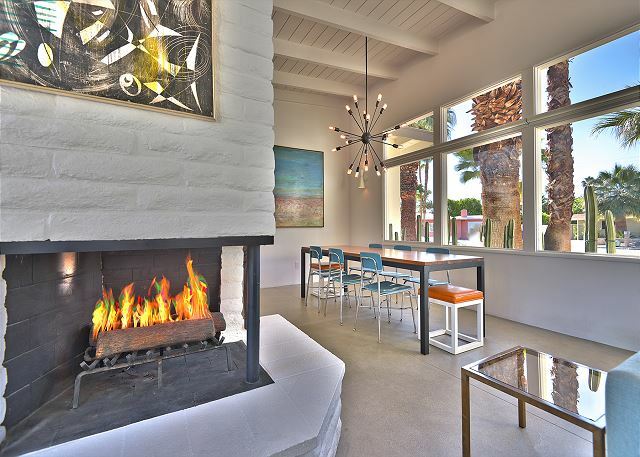 Living room with fireplace, arc lamp, floor to ceiling mid-century windows, and a sliding door to the pool yard. Fireplace next to the dining room with floor to ceiling mid-century windows. Family room off kitchen with a large flatscreen smart tv, dvd, apple tv, and cable/dvr. 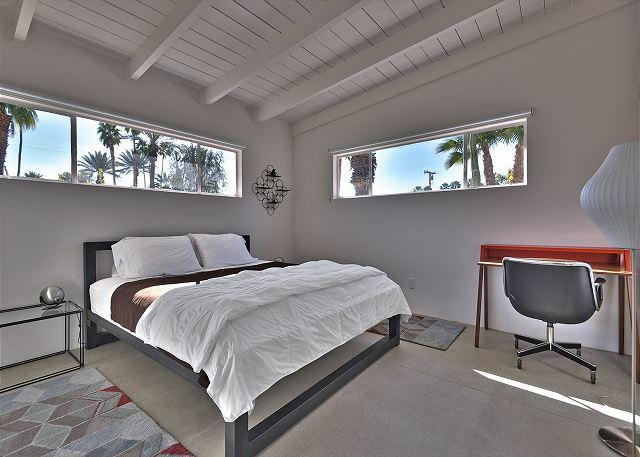 Master bedroom with Cal King bed, Eastern and Southern exposure windows with black out shades, wall of closets, and a desk. Master bathroom with long vanity, bath tub, shower, and Eastern exposure window. Main guest bathroom shared by the two guest bedrooms with queen beds. 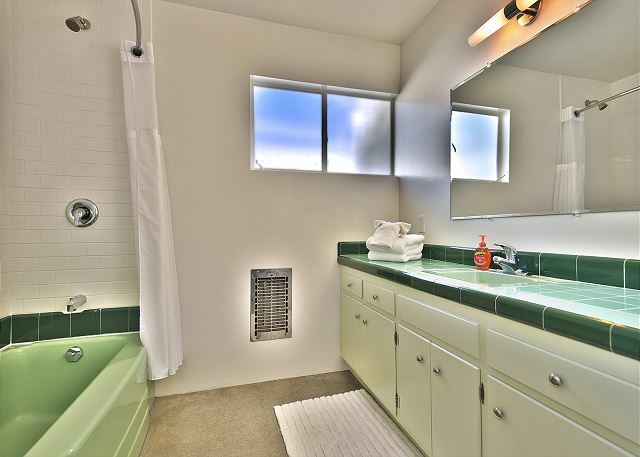 Separate shower and tub and extra long vanity with Western exposure window. Second master bedroom bathroom with long vanity, Western exposure window, and shower. As you enter the front door you see straight through the walls of glass to the 16' x 32' x 7' deep pool and amply furnished deck area. You won’t even get your luggage to your room before the sparkling salt-water pool starts calling your name. 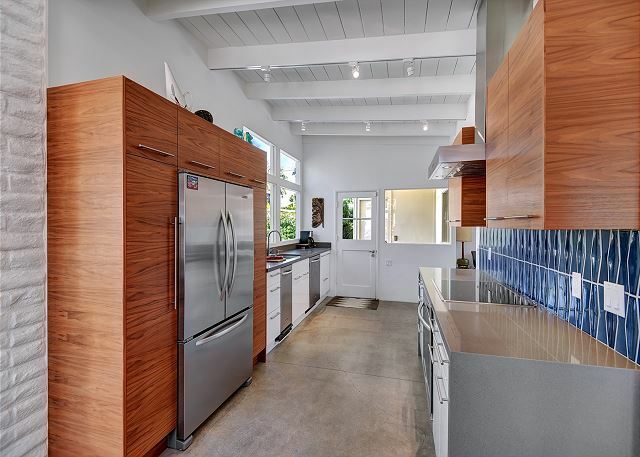 The kitchen was completely remodeled with all new cabinetry and top of the line appliances in mid 2013 and the pool was just redone September 2014. The dining and living room areas boast period furnishings that are both comfortable and stylish, and there is an additional den with a large HDTV if you want to curl up and watch a movie. The house has four bedrooms and three bathrooms. There are two en suite masters with king beds and two guest rooms with queen beds that share a bath. This home is perfect for large gatherings, families, or just 4 people that all want their own space. The owners of this home have spared no expense or effort in designing, decorating, and accessorizing this home. Simple in aesthetics, but nothing but the best made the final cut. 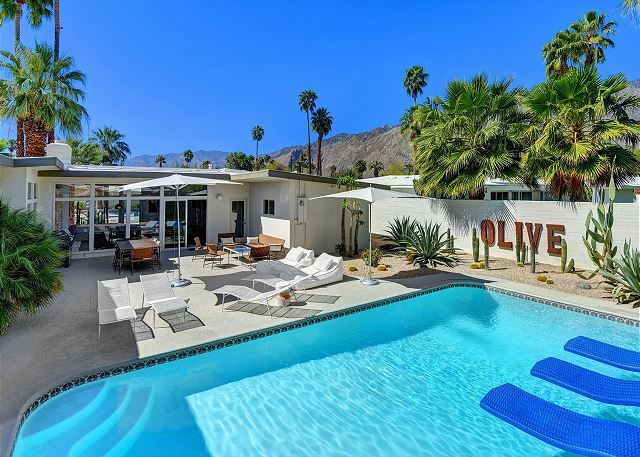 This house is everything you imagined for your Palm Springs vacation. I almost don't want to say how amazing this house is as I hope to be able to rent it again next year! It is absolutely beautiful and very comfortable. The PS noise ordinance warnings did scare us a bit - as the pool/hot tub time could use a soundtrack. We loved staying in this beautiful home! I celebrated my 40th birthday here with friends and family. We all wished that we had a few extra days just so we could lounge all day in the house and pool! Olive House is a beautiful property. The house is well kept and furnished. We spent most of our time enjoying the outdoor space and pool area. The house is located on a quiet block, close to the shops and restaurants of downtown making it easy to get around. 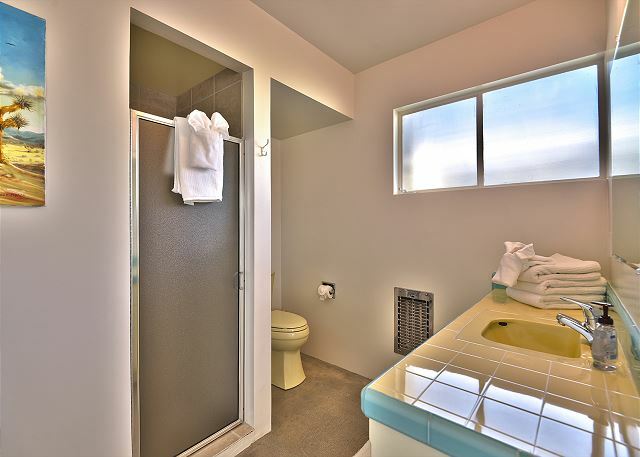 Other reviews given by former renters issue warnings about the use of towels, but as long as you are a respectful guest with some common sense and courtesy, you should not have any issues involving your deposit. We would recommend the landlords update the shower heads in the bathrooms as the water pressure it quite intense and somewhat uncomfortable. Would highly recommend staying here to others. Gorgeous home and fabulous stay! We had a wonderful experience at the Palm Springs Olive house. The photos do not do this home justice, it is absolutely beautiful. A great layout both inside and out. We stayed at this home with a group of friends and had plenty of space. We spent a majority of our time in backyard, lounging in the pool. The house was very clean and was in a fabulous location. 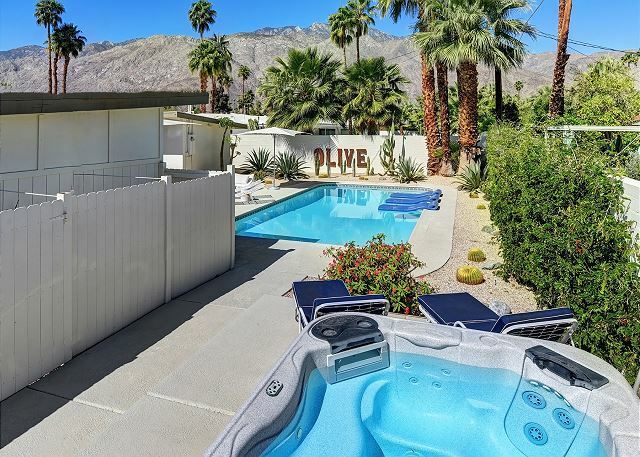 Just a short drive to all the action of downtown Palm Springs. Would love to come back and stay again! We loved the home! The neighborhood was lovely -- nice and quiet, but convenient to downtown. Ruth Hardy Park is nice and close. 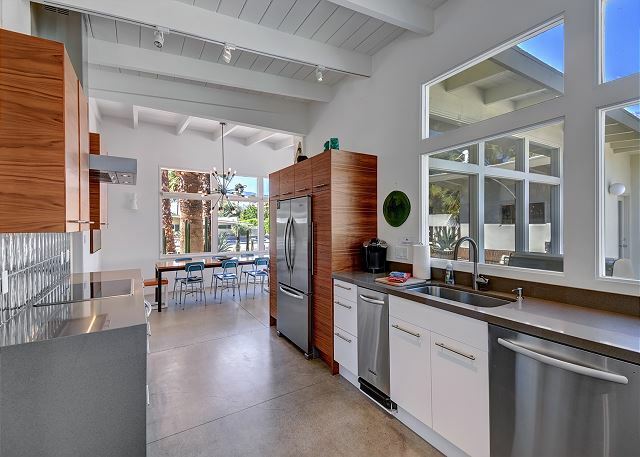 The layout of the home was perfect and we enjoyed all the amenities in the kitchen. We'll be back. We celebrated a milestone birthday at Olive with our adult sons and their families. It was the ideal choice for our group -- the layout allows for quiet and privacy as well as for communal gatherings. The bedrooms are located in two separate wings with a living room and the large pool area between. There is also a large dining room and table, a well-appointed kitchen and a tv room, so there is plenty of space to enjoy. The furniture and art objects are well-selected and consistent with the style of architecture of the house and neighborhood. The view of the mountains from the patio to the west is spectacular, particularly at sunset. Although you would never need to leave the premises, the house is within a few minutes walking distance of a nice park and shops and restaurants. We loved staying at Olive! We enjoyed the house very much and would go back. We loved our stay there. The home was beautifully decorated and had everything we needed. We did a lot of cooking and the kitchen was well appointed. All the architecture books and family games were a nice treat too. 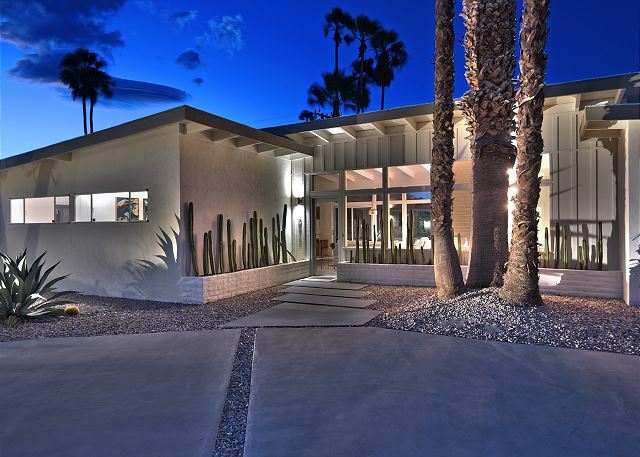 The overal design of this mid century gem was great! The place was clean and and kept up, the neighborhood was central and everything was convenient... Except the pool, the pool was not clean and little disappointing, since the area outside was lovely. The water was off putting and filled with bugs. Also the notes everywhere about towels and deposit was a turn off. The house was lovely- we had an amazing time there. Altamira was super helpful in working with us and making sure refunds/deposits were handled in a timely manner. LOVE this house and will def stay again. The rule book is quite daunting with a ton of fines for specific behaviours, so make sure you read it when you get there! This home is fantastic, all mod cons and furnished to a very high standard. everything you could want and more. Would not hesitate to rent again or recommend to others. Location is also excellent, whilst you can walk to the start of Downtown PS in 20 mins the reality is it is so hot a Taxi Cab for around $7 excluding tip is the best solution if you want to drink and leave the car behind. All in all we had a great stay. We had one query during our stay and James was round within 30 mins in the evening to sort it out. Great service. Wonderful home for our vacation! We had a fabulous time staying at Olive. It was accommodating, decorated perfectly, close to town and the pool is to die for! We will definitely use Olive for our next vacation.